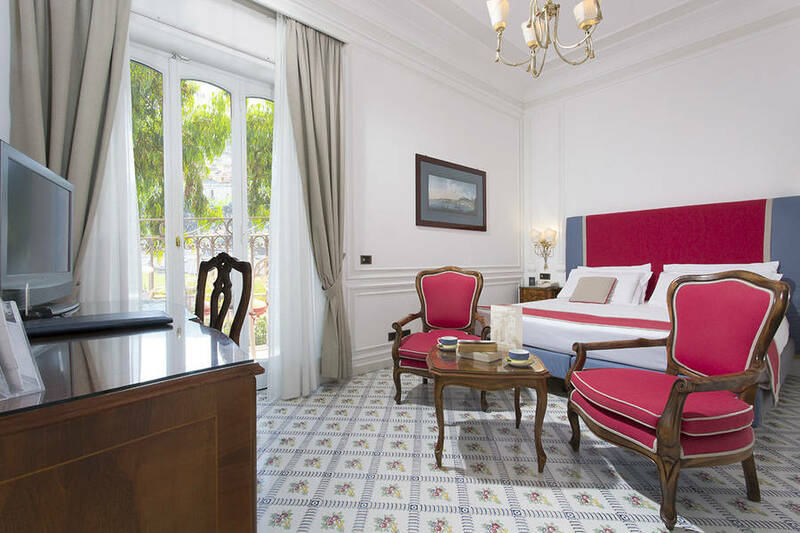 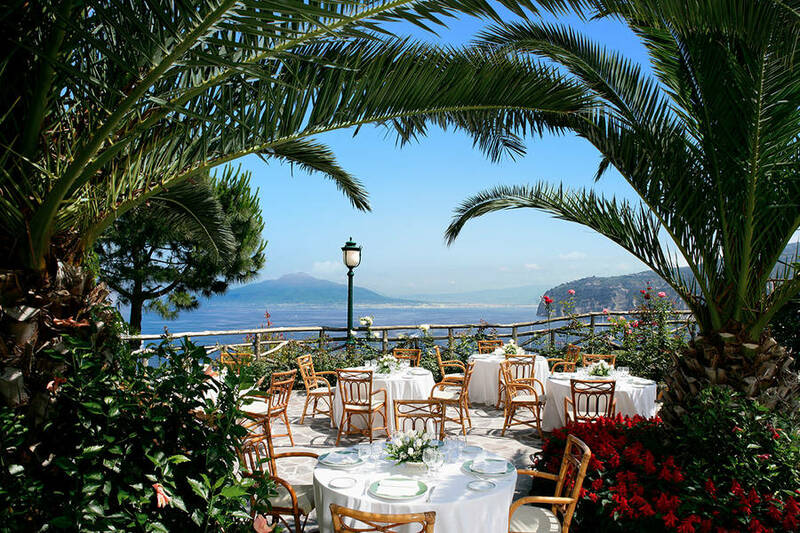 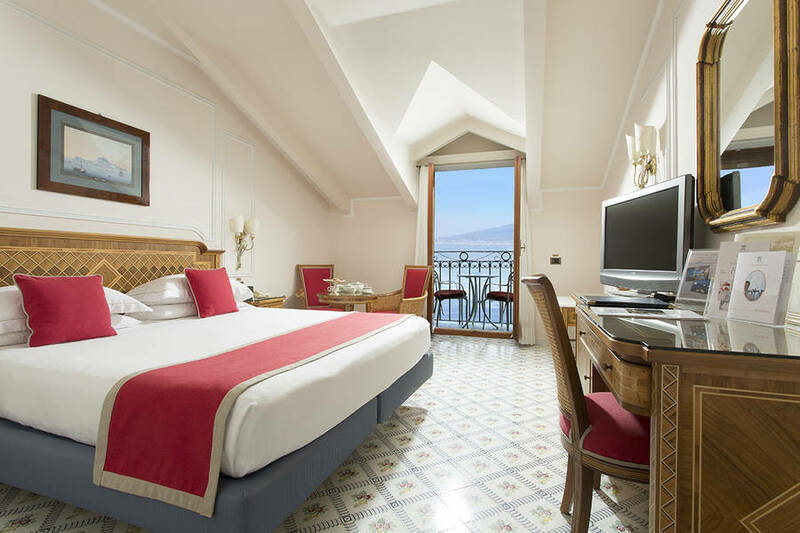 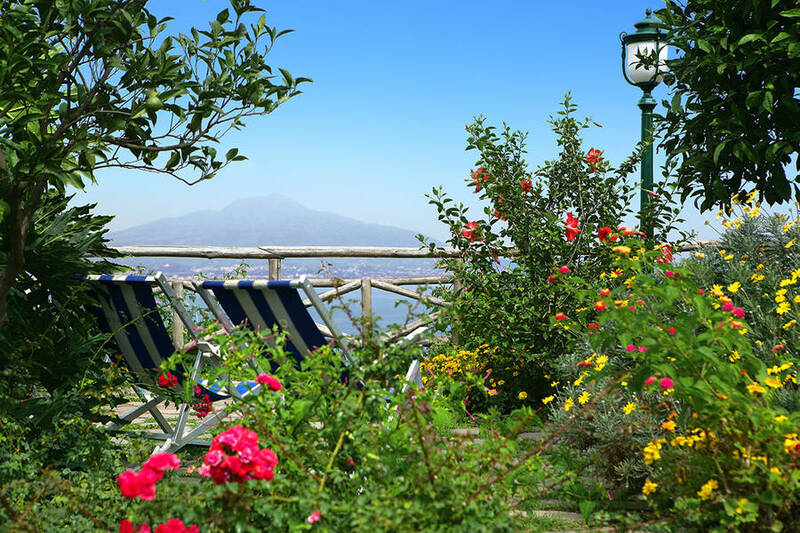 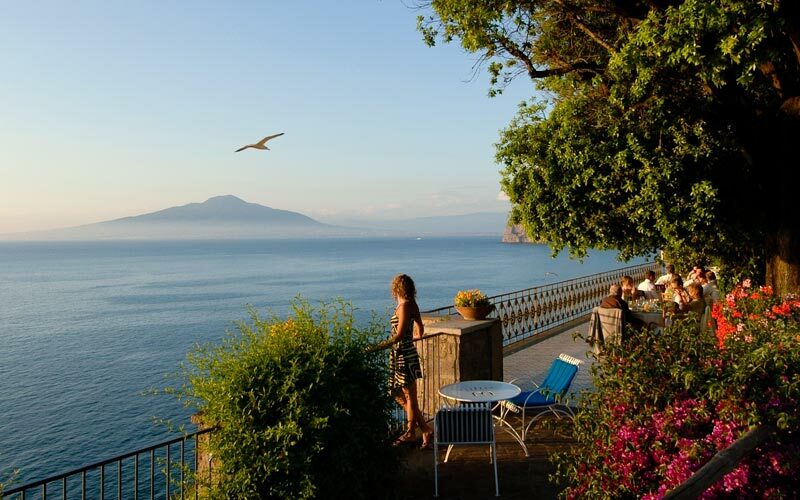 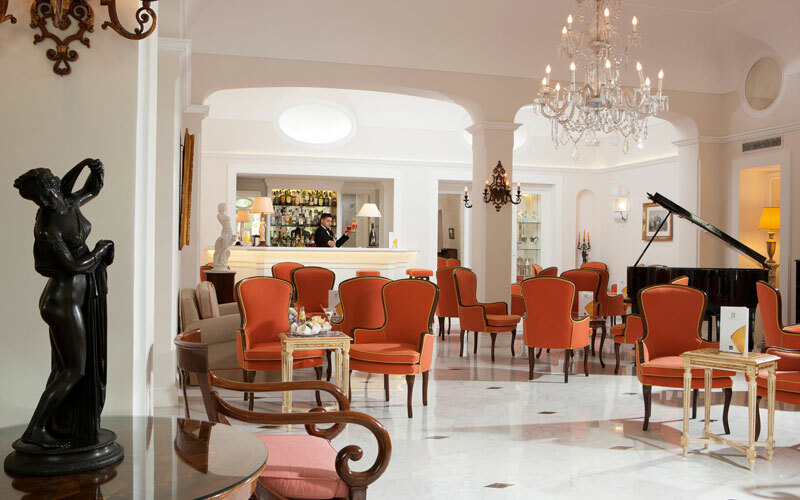 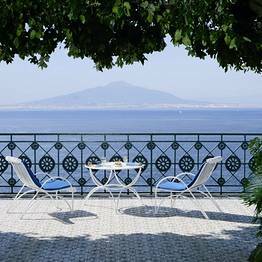 Surrounded by a lush gardens and perched on a clifftop directly above the Mediterranean and looking across to Italy's Gulf of Naples and Mount Vesuvius, the Grand Hotel Ambasciatori is one of Sorrento's most elegant hotels. 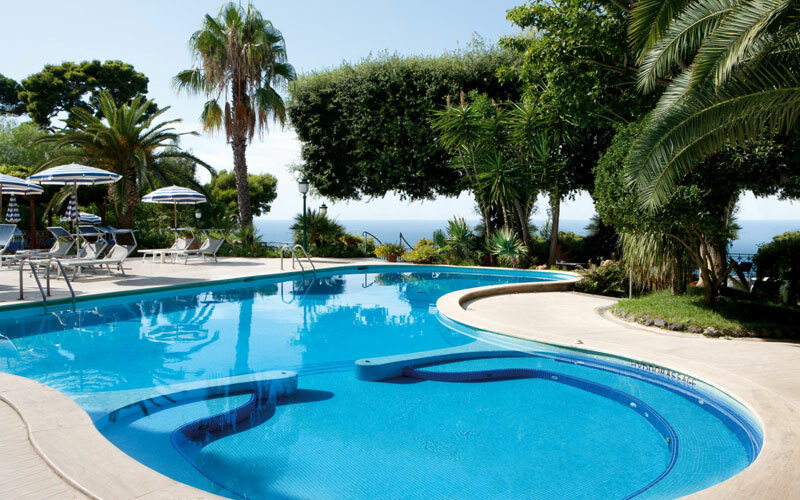 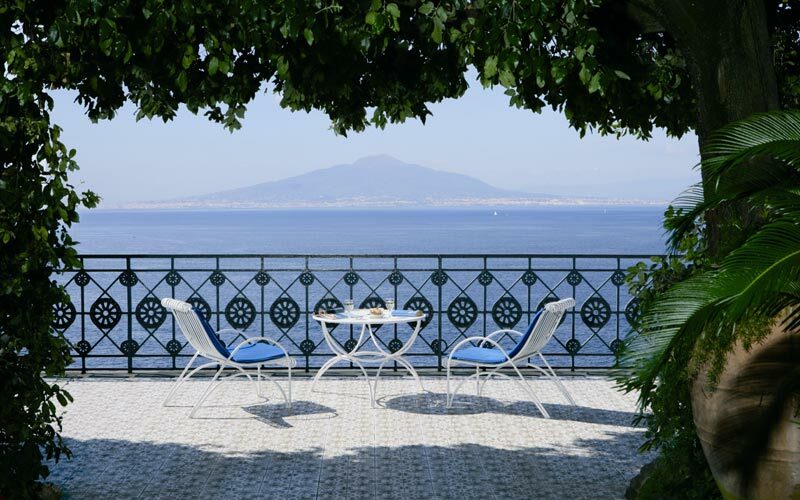 Located just a ten minute walk fom the bustling center of the resort town of Sorrento, this hotel is located in a quiet residential area and has been welcoming both business and pleasure travellers since the 1950's. 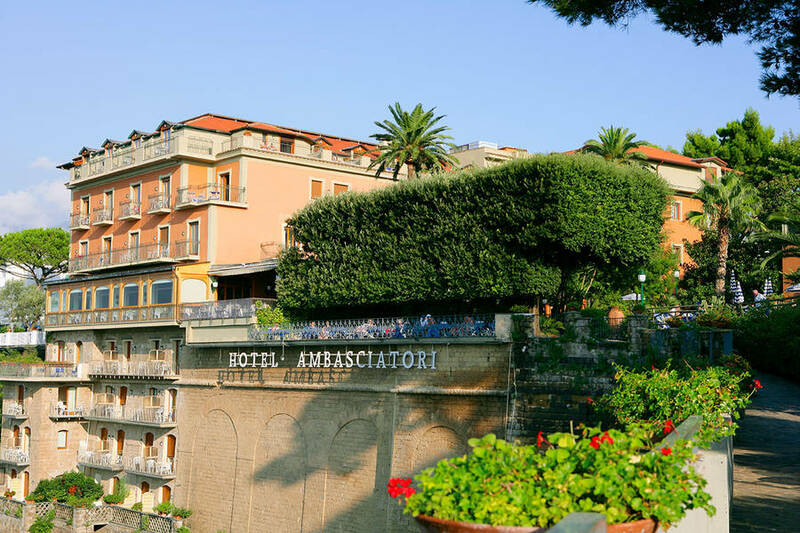 With its perfect mix of high end services and warm, welcoming staff, Grand Hotel Ambasciatori is all you would expect from a luxury hotel on Italy's southern coast. 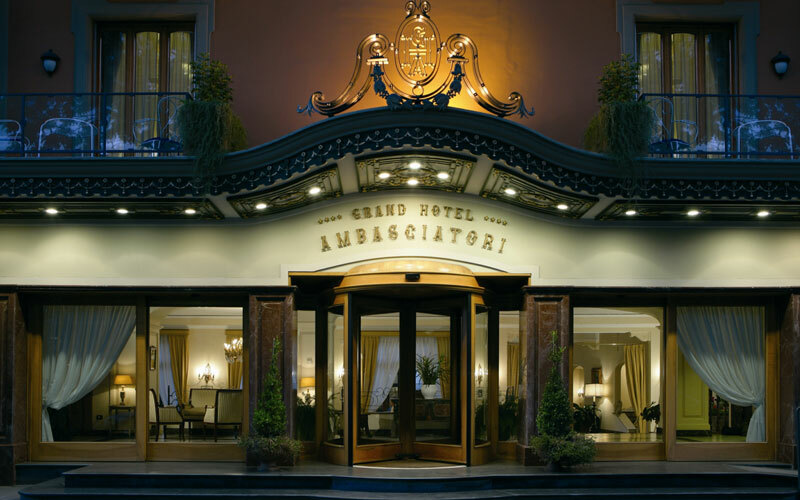 Grand Hotel Ambasciatori's vintage building has interiors decorated with prestigious traditional artisan and antique furnishings, tasteful artwork, a grand marble staircase, and hand-painted majolica floors. 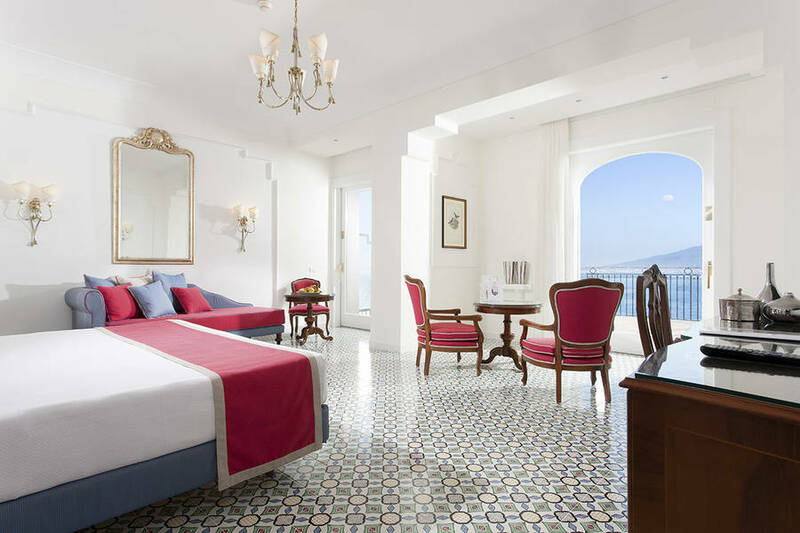 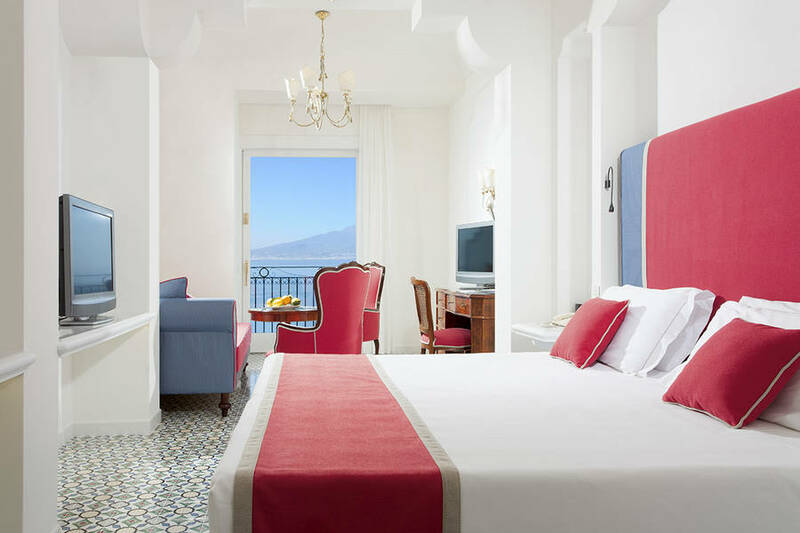 The modern rooms and suites, furnished with understated elegance, have sweeping views of the Gulf of Naples, Mount Vesuvious, and the hotel's vast private gardens. 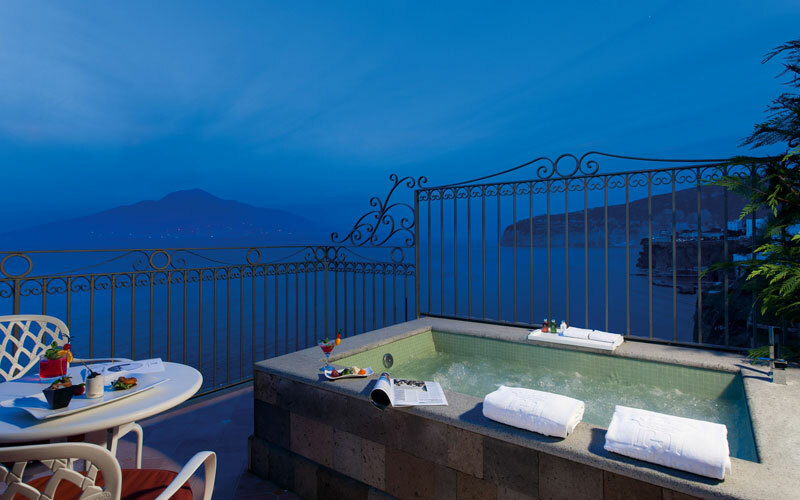 Guests can relax in the hotel's large swimming pool with a jetted corner for hydromassage or on the private beach, which has an elevator directly from the hotel to the water's edge. 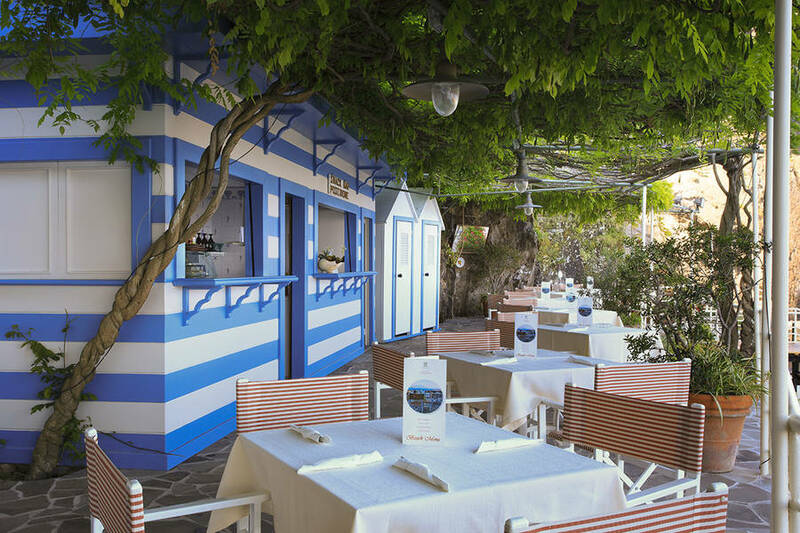 After a day touring or sunbathing, sit down for dinner at the in-house "Le Muse" restaurant, featuring gourmet traditional and international dishes. 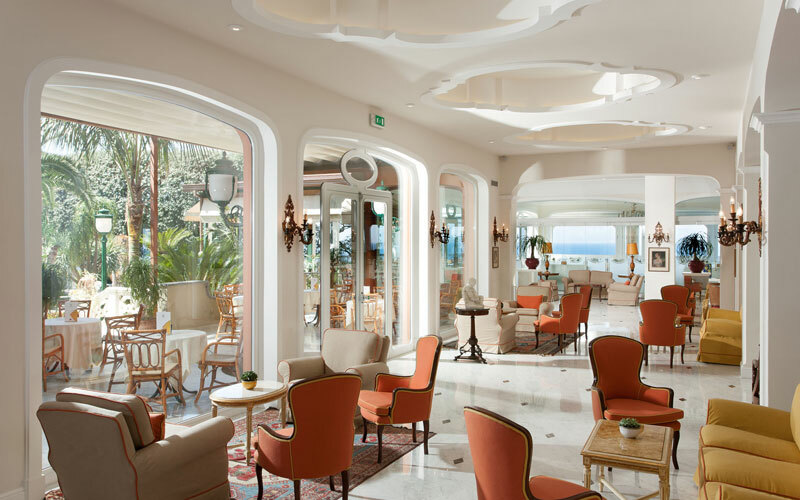 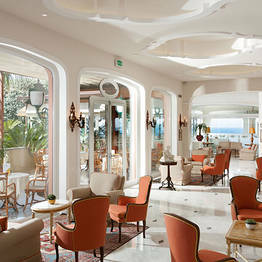 For an morning cappuccino or evening cocktail with a view, the hotel offers three exclusive cafés: Bar "Afrodite", with an indoor lounge and adjacent outdoor terraces on the cliff edge overlooking the Mediterranean; Bar "Poseidone"on the hotel's private pier, for a front row seat to watch the parade of everything from small fishing boats to luxury yachts sail by; and Bar "Dionisio", surrounded by the hotel's thick subtropical gardens. 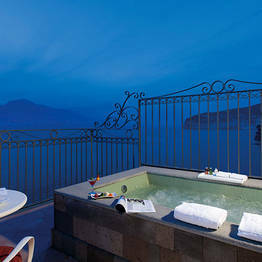 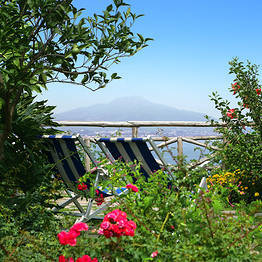 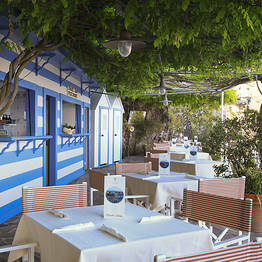 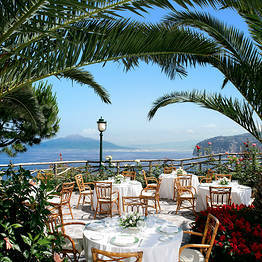 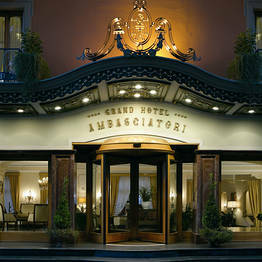 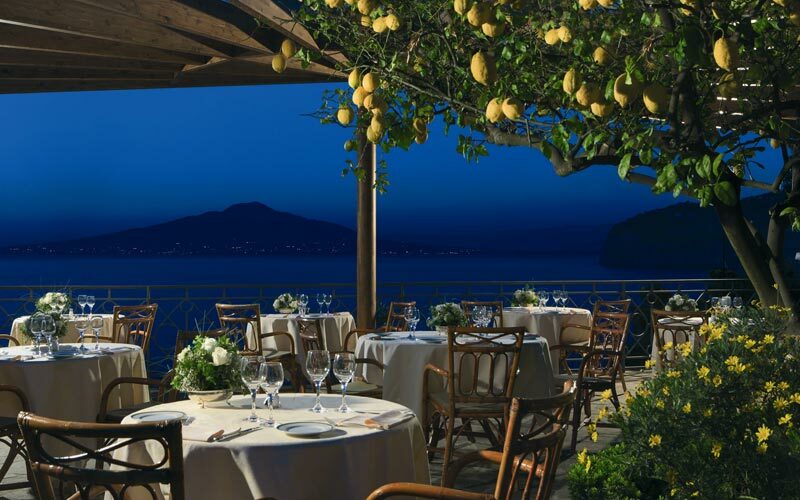 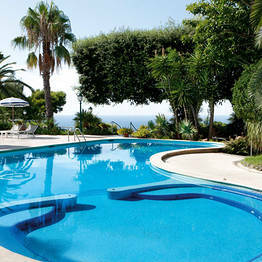 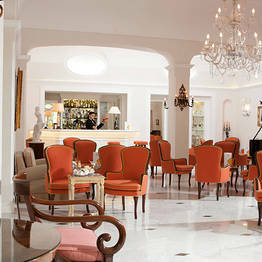 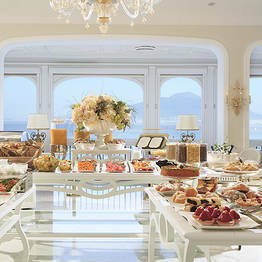 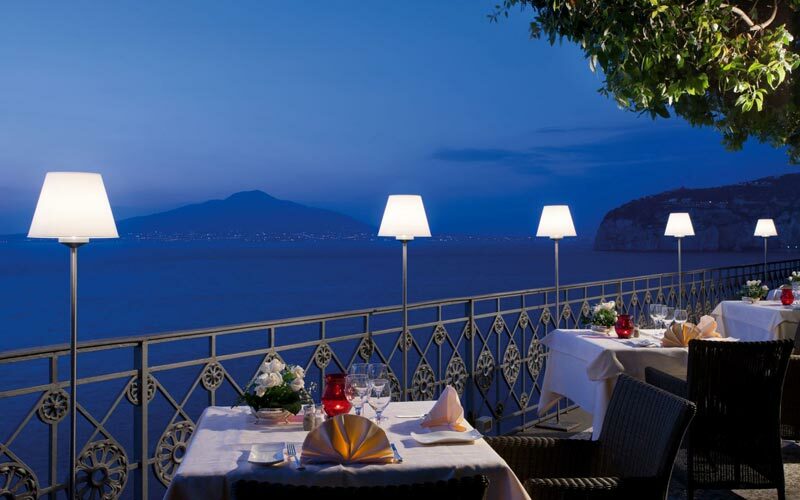 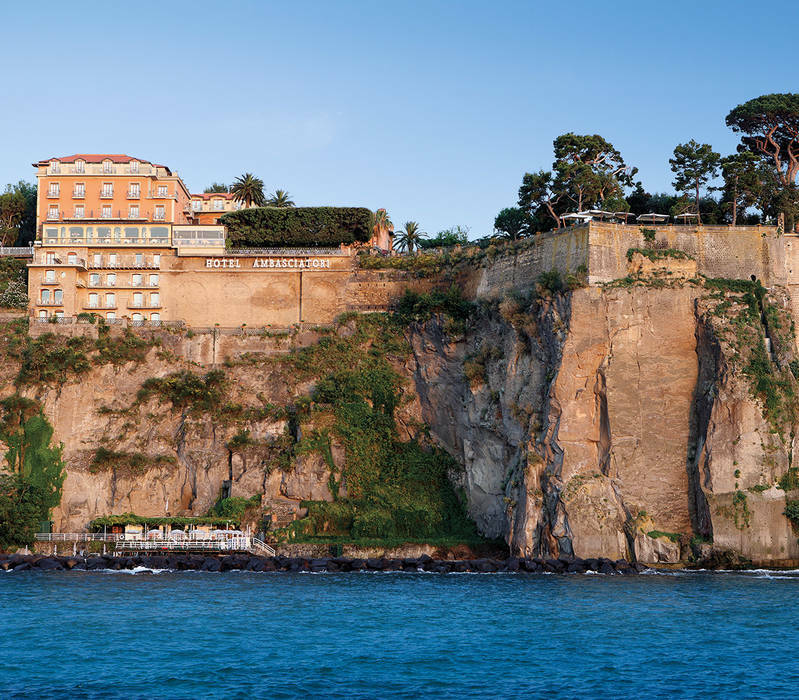 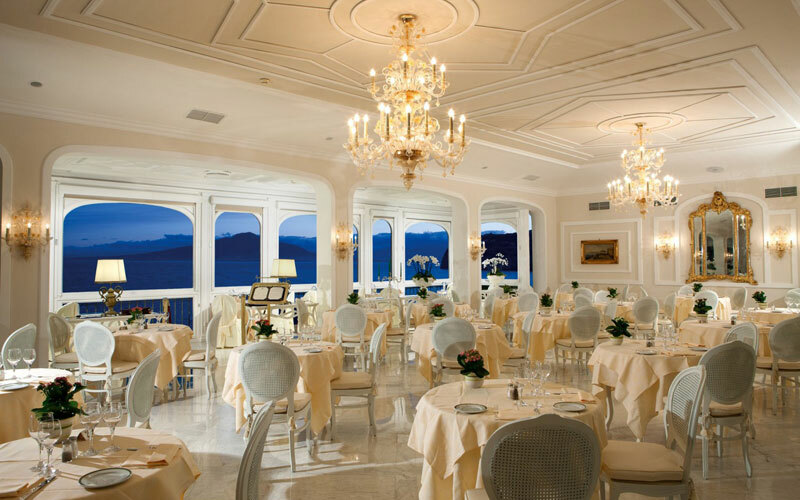 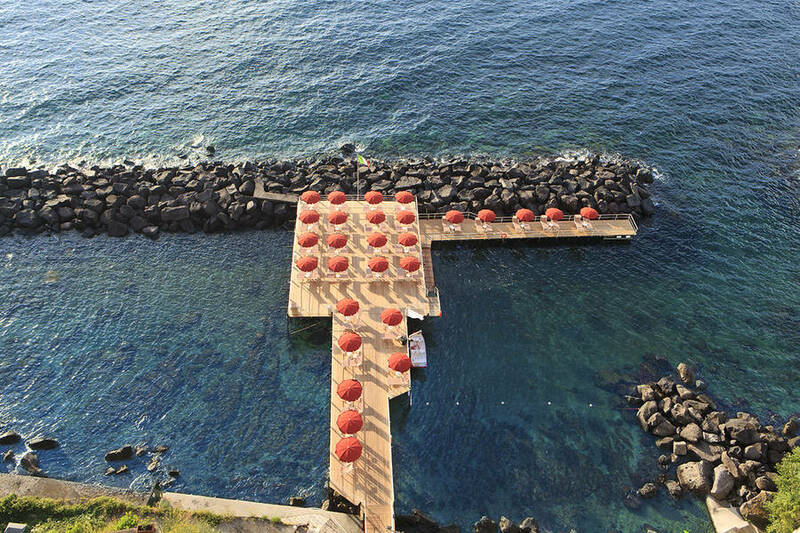 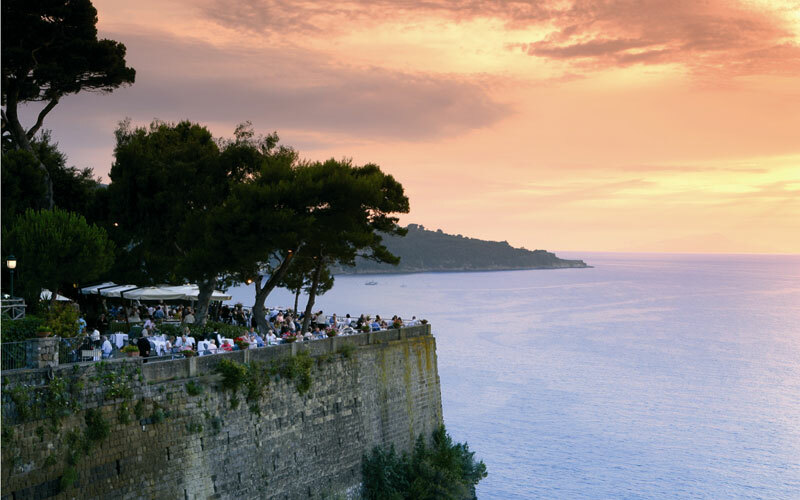 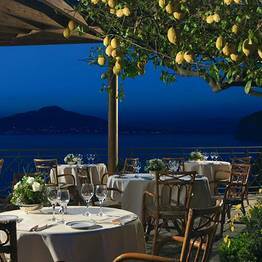 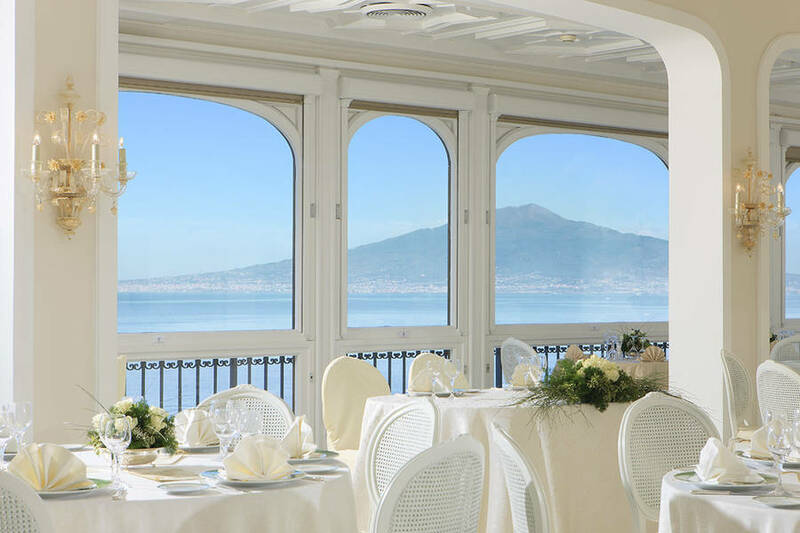 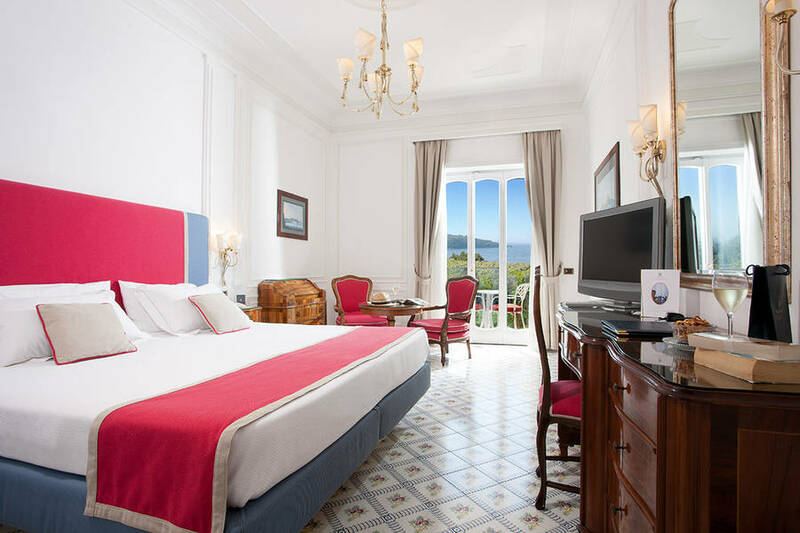 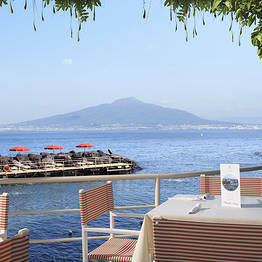 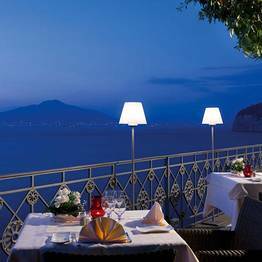 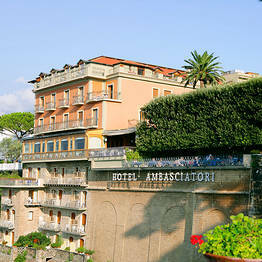 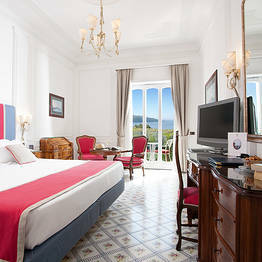 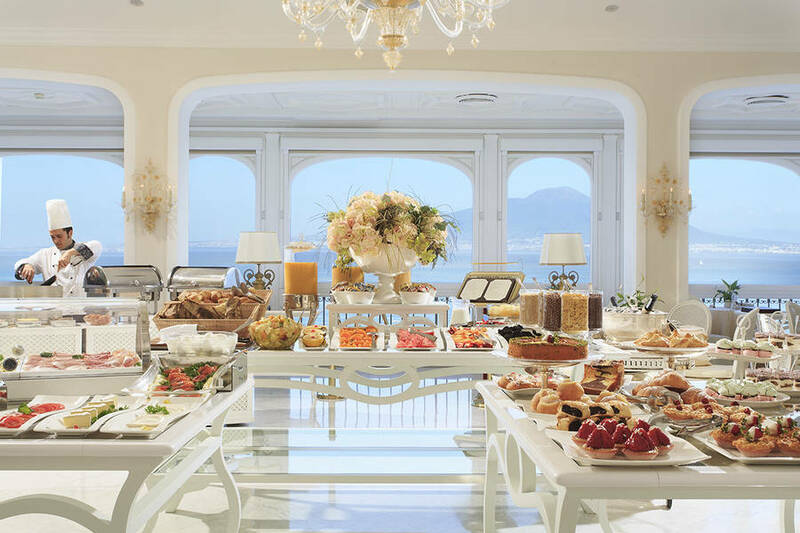 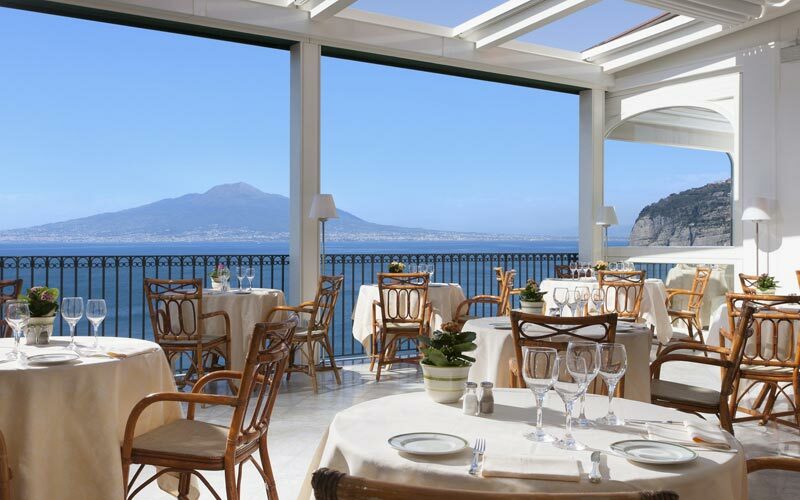 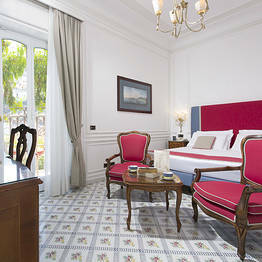 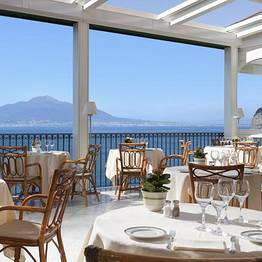 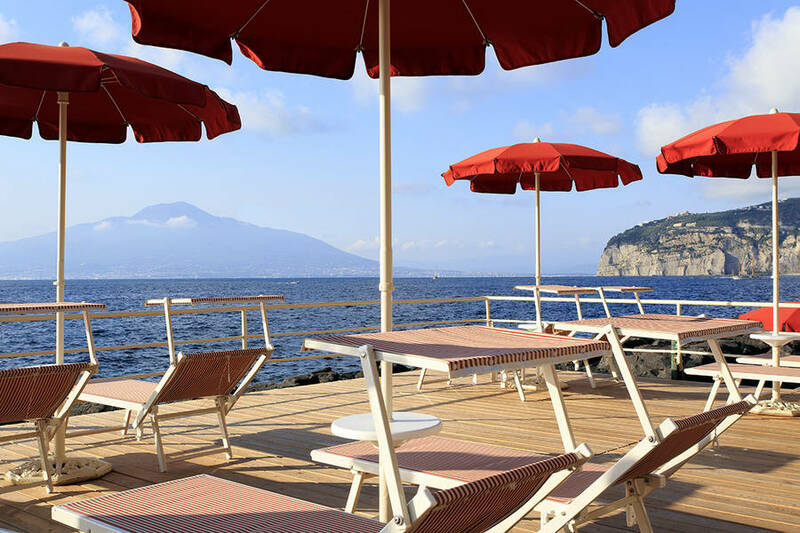 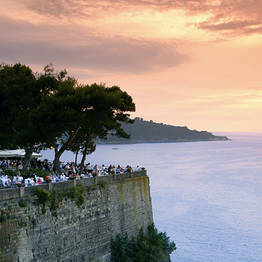 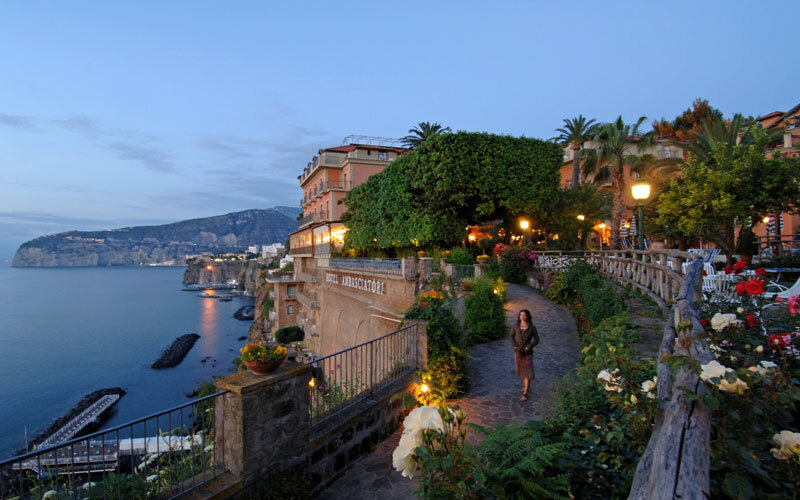 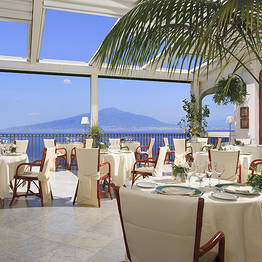 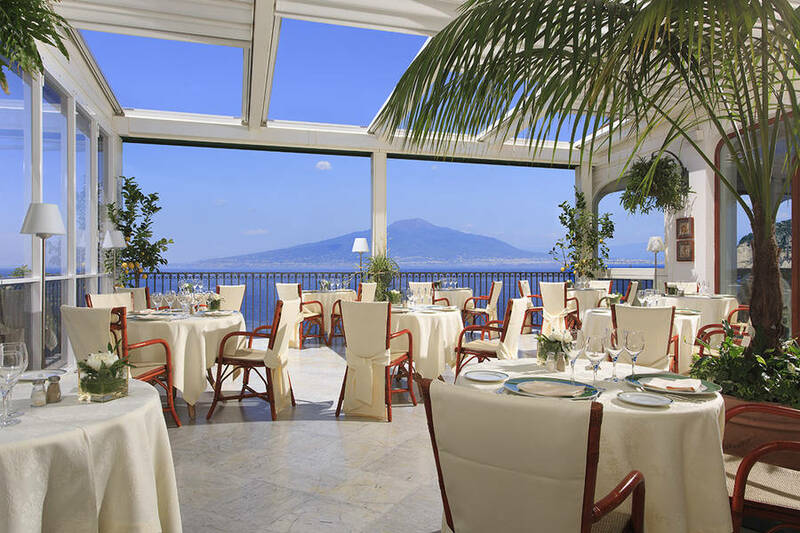 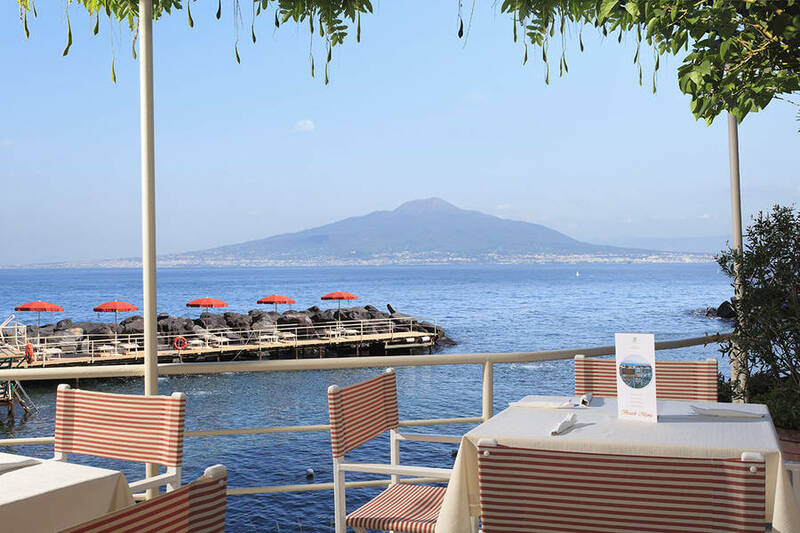 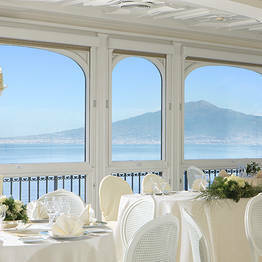 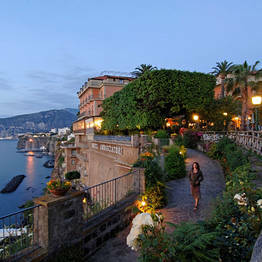 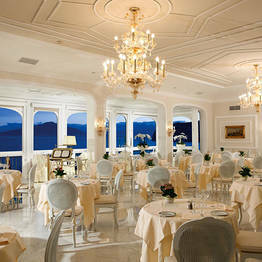 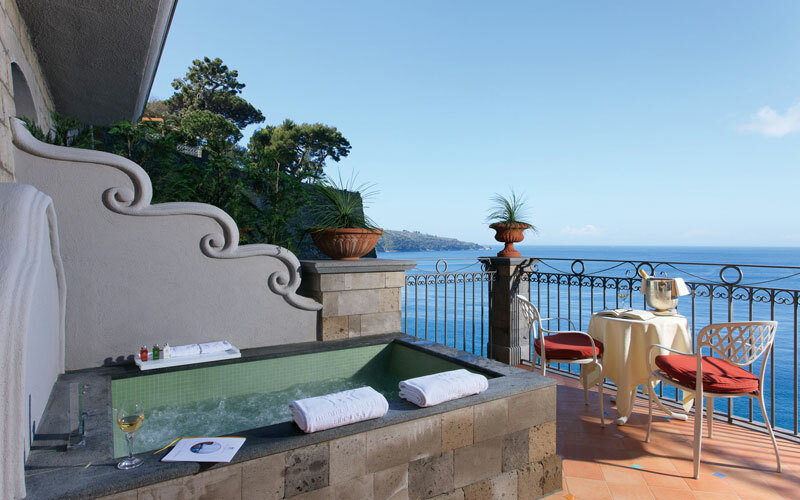 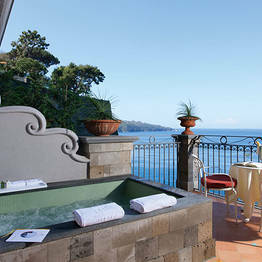 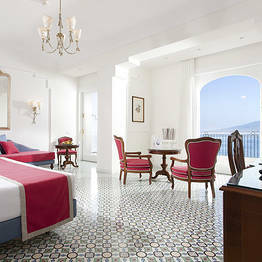 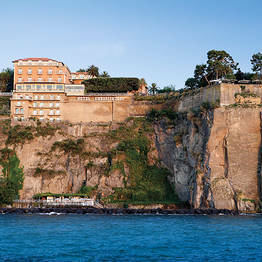 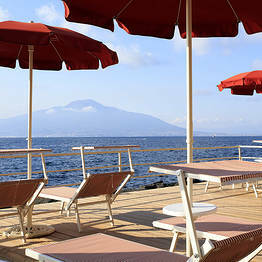 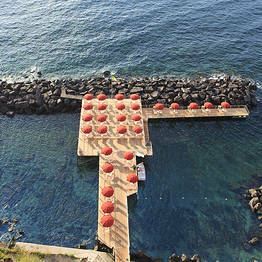 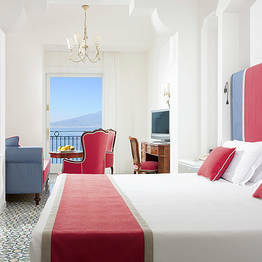 Book Grand Hotel Ambasciatori on SorrentoInsider now with no additional booking fees.